Whether you're looking for new or used wheelchair minivan in San Diego – or need a scooter lift for your van, our San Diego, CA staff can provide every option. We'll make sure you get the right equipment the first time. Stop by and see us soon! 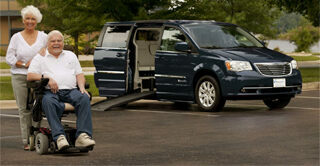 MobilityWorks of San Diego provides wheelchair van rental services to San Diego International Airport (SAN). MobilityWorks of San Diego is offering a special Daily Rental Rate of $99.00 a day. MobilityWorks of San Diego is proud to offer our customers a wide selection of the best mobility products available. Our certified sales and service staff take a personal interest in meeting each customer's individualized needs. We are not satisfied until our customers are fully satisfied.